There are no loose parts to worry about losing. The dental implant is stable and comfortable. No adjustment is needed after placement. Normally, it will serve the patient for life. Occasionally, older patients express concern that their age may prevent them from enjoying the benefits of dental implants. However, health is more of a determining factor than age. If you are healthy enough to have a tooth extracted, you are probably healthy enough to receive dental implants. Certain chronic diseases may contraindicate dental implant treatment. Your dentist will determine if you are a candidate for dental implants after a careful evaluation of your dental and health history. Improved appearance: When you lose the entire tooth - crown and root - shrinkage of the jawbone may cause your face to look older. Dental implants can stop this process. A traditional denture or dental bridge does not. Preserve natural teeth: Dental implants often eliminate the need to modify healthy teeth. Permanent solution: There are no loose parts to worry about losing. The dental implant is stable and comfortable. No adjustment is need after placement. Normally, it will serve the patient for life. Expected Results/How will implants affect my life? Dental implant-supported replacement teeth look, feel and function like natural teeth. This means that you can eat and drink whatever you choose. 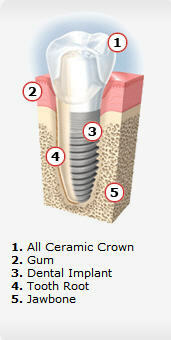 But most importantly, dental implants often improve quality of life in a very concrete way. People who have felt embarrassed and worried because of their tooth problems are often overwhelmed by what new permanent teeth can do for their self-esteem. Today, state-of-the-art guided surgical techniques can be used to place dental implants and allow you to have the dental implant placed in a single session using keyhole surgery. This new method has significantly simplified the procedure, for both patients and dentists. The major advantage of the guided surgical technique is the minimal amount of manipulation of the soft tissue due to keyhole surgery. This significantly reduces the healing time and the discomfort normally associated with traditional dental implant surgical techniques. The conventional process can take from three to six months. First, the dentist places the dental implant, which is left for three to six months to heal and integrate with the jawbone. During the healing period, your can be given a temporary prosthesis until the permanent crown is put in place.